“Dawn P,” as she is affectionately known, is the ultimate cheerleader and consummate ambassador for the City of Sugar Hill. Dawn P. has been active in the community her entire adult life. She is a member of the North Gwinnett Kiwanis and attends Sugar Hill Church. She owns a successful and respected real estate company and is an avid tennis player. Dawn P. has dedicated her life to public service and the idea of creating and building a downtown Sugar Hill. Through her over 12 years of service to the Sugar Hill Downtown Development Authority (DDA), a responsibility she has embraced, downtown Sugar Hill is taking shape and is receiving accolades from throughout Gwinnett County, metro Atlanta and across the state. Her vision and passion for Sugar Hill combined with her energy and work ethic have been pivotal in the continued growth of the “Sweet City”. The only thing that Dawn P. treasures more than Sugar Hill is her faith, family and friends, whom she holds close to her heart. It is often said that anyone that meets Dawn P. becomes an instant friend and she always treats her friends like family. 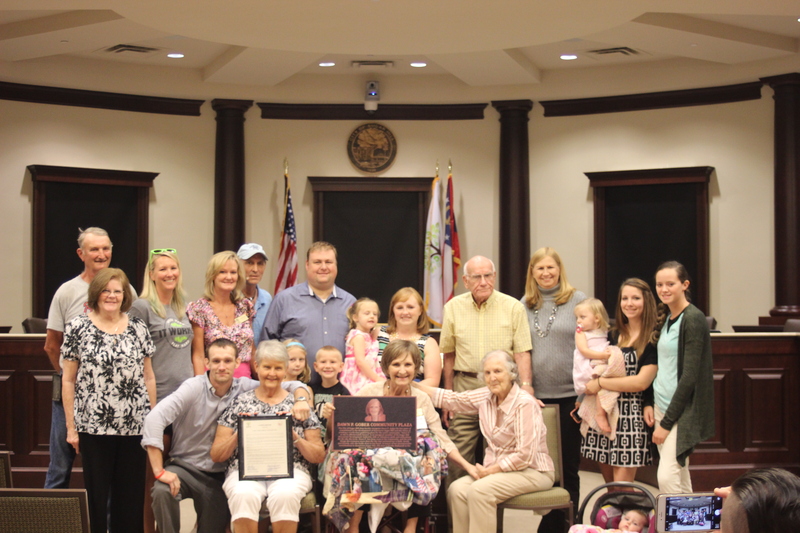 Family and friends gathered to surprise Dawn P. as the proclamation was read at the City Council meeting. Upon hearing the proclamation, in true Dawn P. fashion, she had a gift to give back to the city. 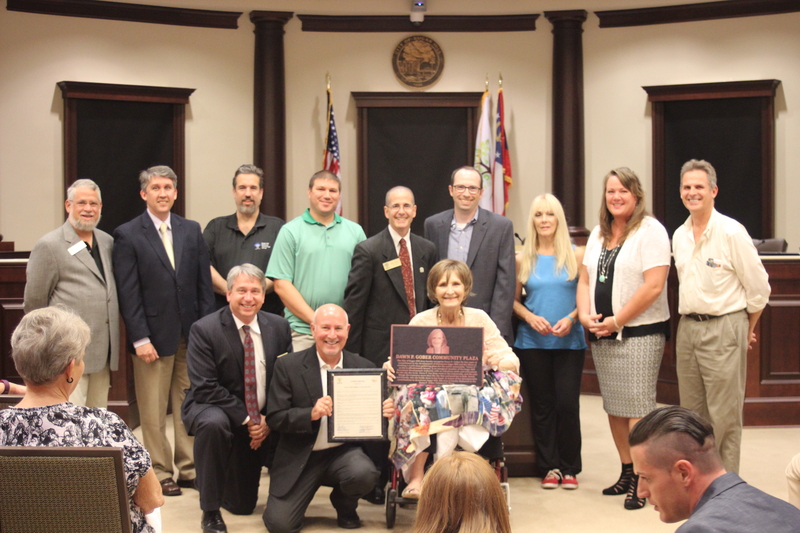 She presented the city with a photo that she had found and framed of the first commercial building ground-breaking in Sugar Hill, TG & Y Department store. The Plaza is the perfect place to honor such a bright individual. The next generation of City Council Members will be found laughing, playing, and splashing in the Sugar Hill Splash Park adjacent to the Plaza. Future Downtown Development Authority members will be picnicking and dreaming in the Plaza with their families. 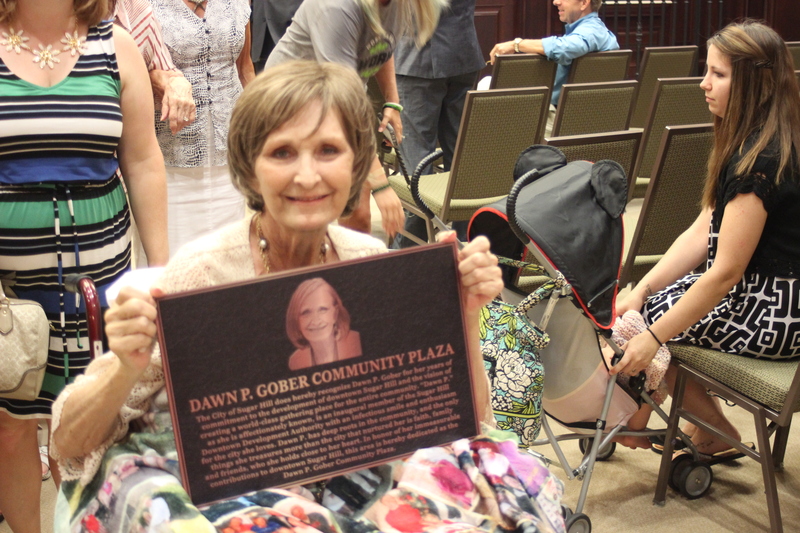 A beautiful plaque featuring Dawn P.’s infectious smile will adorn the Plaza, reminding us all to stop and enjoy the “Sweet Life” just as Dawn continues to do. 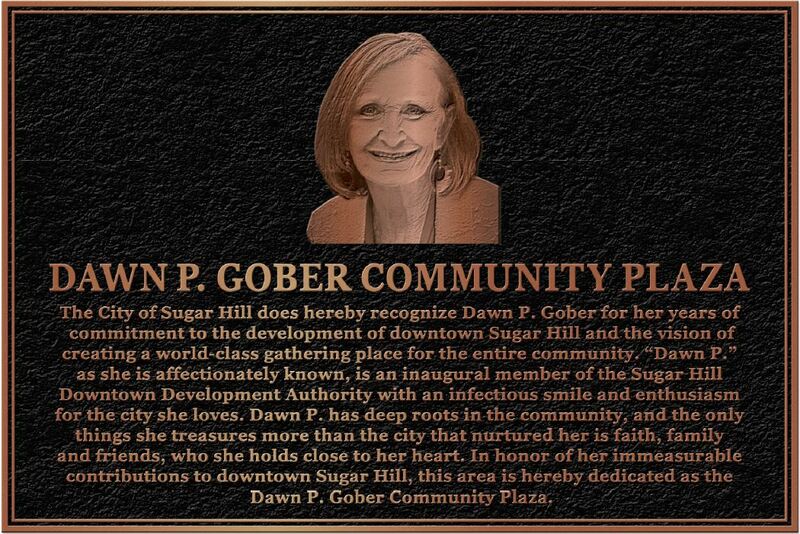 “The Dawn P. Gober Community Plaza” will be known as the official home of sweet memories and future dreams and aspirations of Sugar Hill.